Today I will be reviewing an incredible internet marketing tool for maximizing profits on Aliexpress. That tool is SpyCom. Now before you get skeptical because of the name, let me assure you that this is not some kind of spyware or illegal software. 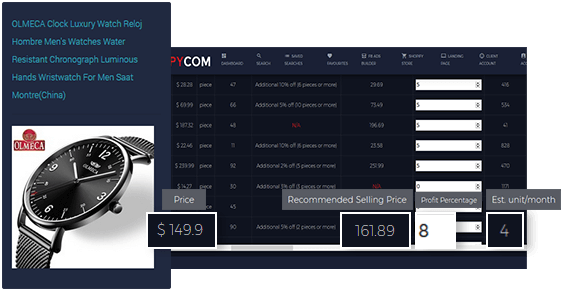 Spycom is the world’s first and leading cloud based AliExpress research tool that specializes in finding your products that will make you the most money, or fit the descriptions you are looking for. This makes marketing with AliExpress easier and increases your sales potential! E-Commerce, the revolutionary shopping trend has been with us for almost two decades now, following its launch around 1991 when the public was now able to shop online. It certainly has created a shift in how we trade today! From the traditional marketplace where the buyer and seller have a physical interaction to one where trade transactions are done online. Usually with little or no physical contact between the buyer and seller. While this experience of shopping online has undergone a lot of changes and improvements over the years, many online platforms have contributed to its huge success. Just as many e-commerce platforms came on stream, a lot more brick and mortar stores/businesses shut down. Over the years, e-commerce has witnessed tremendous growth, due to its offering of convenience as well as engendering the concept of global trade meaning the barriers to cross border trade have greatly been reduced. With China’s adoption of the internet in the early 1990s which started with the creation of Electronic Data Interchange and Electronic Funds Transfer technologies, the stage was set for the takeoff of e-commerce. However, not until when Jack Ma built the nation’s first internet company called China Yellow pages, did the reality of e-commerce begin to take shape. This could have accounted in part for the transformational economic development that China has experienced in the past three decades. Exactly two decades ago, Jack Ma led a team of ambitious Chinese developers and investors. Their goal was to launch China’s revolutionary and biggest e-commerce platform called Alibaba (founded on April 4, 1999). About a decade later, Aliexpress was created to cater to the retail (B2C) needs of shoppers, leaving Alibaba to focus on the wholesale (B2B) market needs. Since both platforms were created, the total percentage of China’s e-commerce contribution to the global trade value has grown from just about 0.6% in 2005 to about 42.4% in 2016. This is according to the World Economic Forum in the article “42% of Global E-commerce is Happening in China. Here’s Why” where it attributes this tremendous growth to China’s increasing use of mobile payments and greater digitization of the Chinese economy. There is no doubt that China’s large population is a driving force behind the huge success of the nation’s e-commerce story. As it stands, Alibaba and its other e-commerce operations generate over 80% of its business from within China. Aliexpress (the retail B2B arm of the Alibaba group) has been likened to Amazon. It is suggested that it will give the American e-commerce site a good run for its money within the global space. Assuming the next few years are in continuation of China’s growing market dominance, of course. Within the bigger ecosystem of large e-commerce platforms, there exist a thriving number of small scale individual based e-commerce operations majorly referred to as online stores. The bulk of these individuals create their online stores on social media platforms like Facebook and Instagram, especially on Facebook. The approach is that these individuals shop for their products from e-commerce platforms like Aliexpress and resell with the aim of making a profit. As with any growing platform, Aliexpress has its own fair share of limitations and customer frustrations especially for online store owners who are looking to create their own little platform within the growing e-commerce ecosystem. Major among these frustrations is the issue of fake suppliers on the e-commerce platform. This is beside the fact that given the nature of online stores, with similar offerings, there is a strong desire for a competitive edge that drives profitability. As always with technology and in a world where ideas never stop being originated, there exists a one-stop platform that provides solutions to these challenges. That platform is called SPYCOM. 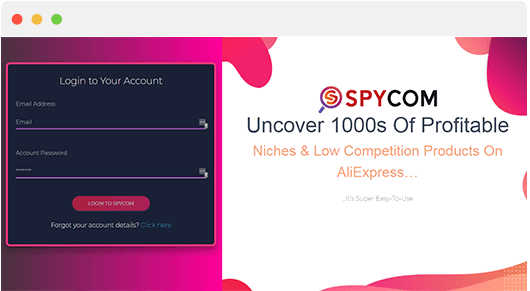 Spycom is an automated breakthrough software tool created in October 2018, that assists online store owners to navigate, discover and identify thousands of hitherto yet to be exploited products or product categories on the Aliexpress platform to sell that are capable of providing good profit margins. It also identifies, recommends and connects authentic product sellers on the Aliexpress platform to online shop owners who are wary of fake products. The Spycom software, sieves through tons of available data on the Aliexpress platform to make its recommendations to online shop owners. It scans through millions of product categories, downloads product images, and description as may have been requested by the shopper. It is basically a product research software tool, specifically for the Aliexpress platform. In case you missed it the first time round, it is the world’s first and leading cloud-based Aliexpress research tool. Spycom has two key product bouquets, Spycom LITE, and Spycom Multi which sell for only $36.99 and $39.99. Having a piece of the e-commerce pie has never proven to be this easy and simple. While it can take you a lot more time to build your own online business platform within the ecosystem, you have a choice to leverage the many benefits that Spycom offers you to grow a profitable business. Thank you very much for sharing with us such an important blog. If I did not read this blog I can not find the details about SpyCom. This blog will be very helpful for online marketers. The most important thing I just learn from here is Spycam is the world’s first and leading cloud-based AliExpress research tool that specializes in finding the products that will make us the most money, or fit the descriptions we are looking for. I will definitely share this blog with my friends. It is true that we as customers place a lot of trust in the internet and the suppliers on the web. While a brick and mortar shop will hand over the goods at point of sale, internet purchases are made on faith that the product will arrive on the other end when purchased. This tool is great for verifying that companies are who they say they are. My question relates to privacy laws since that topic is gaining in prominence. How does this product circumnavigate the privacy rules and regulations related to companies on the web? Well, there are plenty of legal disclaimers as needed, and this software is fully legal. If you were looking for some kind of specific tool for AliExpress, it would be this one. It makes affiliate marketing with that platform SO much easier! Good to hear, Aweda! I think you will find that this sofware really does perform well and makes online marketing for profits easy! What I like most about E-Commerce is it doesn’t take too much money or time to create an online business and platform like Shopify provides a professional looking website for a very affordable price. Selling product from platforms like Ali expresses you can create a business in very quick time. Tools like spy cam can be a great help for making a profit. Thanks for sharing this tool. I was just looking for this. As a producer and exporter of blueberries here in Argentina, I have used Alibaba to be able to locate potential buyers of my products abroad. Today I continue to promote my products through Alibaba. I did not know SpyCom, I think this tool is great to avoid false merchants. Thank you for sharing such a valuable post any doubt I will consult you. I remembered the frustration dealing with the vendors when I worked for a merchandise company back in Thailand. The only way we can contact the vendors from Alibaba is either through the alibaba inbox messages, Skype, or email. The vendors back then would just provide us only the pictures of the product, let’s be honest picture is picture the arts of photoshopping existed back then as well. Only big vendors will send out samples the small ones only pictures. It was like gambling in a casino, if you are lucky good for you and if you are not too bad. Now we just have a platform that will do all the work for you lol Life is much easier now. I have recently purchased a tablet from Aliexpress. The specs mentioned was very promising but when I got the tablet it was nothing like the specs they listed. Just so you know, I spent a few hours reading the reviews and doing my research. Luckily, I got my money back from Aliexpress. Spycom looks like a good feature for all the e-commerce owners. Will reccommend Spycom to my friends who is selling their products with Aliexpress.